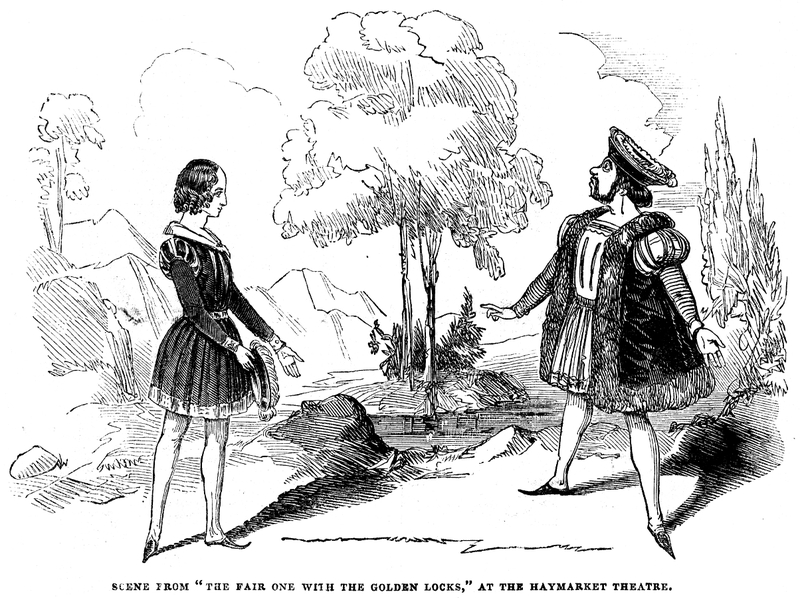 Scene From The Fair One With The Golden Locks, at the Haymarket Theatre. A fairy burlesque by Mr. Planché entitled "The Fair One with the Golden Locks," a subject taken from a comparatively unknown source, was produced at this popular house of entertainment on Tuesday last, and from its reception, we cannot but augur that the golden locks will be attached to golden coffers. As in all things of this kind, something out of nature is looked for we have accordingly a haughty princess who requires of the ambassador of the aspirant to her hand the following pleasant performances:--first, to pick up a ring from the bottom of a dangerous river; next to subdue and kill a redoubtable ogre; and lastly, to fetch "the water of beauty" from a fountain that is fiercely defended by a guard of dragons. Having been zoologically philanthropic, unlike "the hare with many friends," some of his brute acquaintances turn out to be grateful and serviceable to him. A fish finds the ring for him--a crow de-occulates a giant, to whom he is opposed, and an owl kindly supplies him with the desired magic water. The princess, as in promise bound, marries her royal suitor, but, king as he is, like some others, he proves to be but a "sorry Benedict," and at last effects his exit by a certain mistake of a lotion, making room for his young champion, who, from the first, seemed to have found favour in the fair one's eyes. Miss P. Horton made her first appearance these two years as Prince Graceful and looked and acted and sang most charmingly. The piece was decidedly successful but would be much improved by a little curtailment.